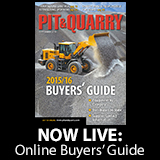 Niklas Haver, chairman at Major, a Haver & Boecker company, accepted the 2019 Pit & Quarry Hall of Fame honor on behalf of Washington Samuel Tyler. George Sidney joined McLanahan as a design engineer before working his way up to president and COO. Now he holds a place in the P&Q Hall of Fame. Manfred Freissle, the co-founder of Polydeck, describes the support he received throughout his career during his acceptance at the P&Q Hall of Fame. Tommy Fisher, president and CEO of Fisher Industries and the son of 2019 inductee Gene Fisher, accepted the honor on behalf of his late father. 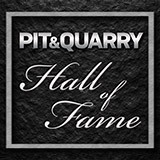 Check out videos from the 2019 Pit & Quarry Hall of Fame, which took place Feb. 11 in Indianapolis. Always putting the producer first, former McLanahan President and COO George Sidney made a lasting impression on the industry. Washington Samuel Tyler was a pioneer who set standards for wire products and developed equipment that changed the nature of screening. Manfred Freissle, a man motivated by family and faith, developed an innovative screening product that moved the aggregate industry forward.